Detailing the physical features, habits, territorial reach and other identifying qualities of the Oleander Hawk Moth. The Oleander Hawk Moth is a large, sleek moth that thrives in warm climates and hides among dense lush green foliage. Native to Asia, Africa, and parts of Europe, the Oleander Hawk Moth arrived in Hawaii in the 1970's. This member of the Sphinx Moth family is large like its cousins. An adult's wingspan can stretch to almost 10cm (4 inches). The wings are a collage of green colors ranging from light green to olive to dark forest green. This patchwork of green resembles camouflage fatigues issued in the military. 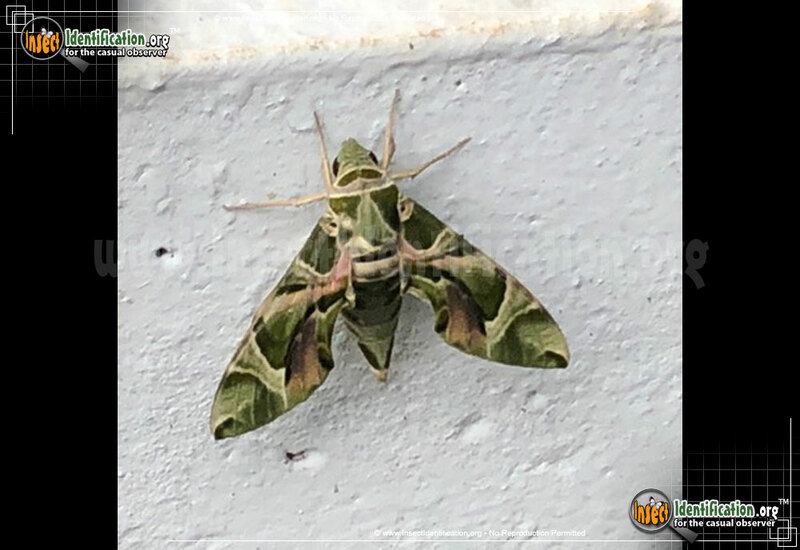 For this reason, the Oleander Hawk Moth is also called an Army Green Moth. Its legs are tan. A tan eyespot sits on each wing where it attaches to the body. The forewings have a hint of pink on the inner edges. Bands and lines of white, brown, and tan criss-cross over the wings. The abdomen (body) is green with a black and tan belt across the middle. Caterpillars are plump and green. Two light blue eyespots surrounded in black can be seen just behind the head on the dorsal (back) side. A white line runs along the length of the body on either side. An orange-yellow horn at the rear resembles a thorn or stinger. The whole caterpillar becomes dark brown just before it pupates. Look for brown pupal cases with black side dots in leaf litter on the ground. Oleander Hawk Moth larvae eat the foliage of oleander, possessing immunity from the chemicals in this poisonous plant. They also feed on vincas, grapevines, gardenias, and members of the dogbane family like crape jasmine. Adults drink nectar from scented flowers like honeysuckle, petunia, and jasmine. They are most active in low-light hours, especially dusk, which means it may be even more difficult to see it in its natural element.